Working in collaboration with RNIB we have created these unique labels that can be affixed to clothes to identify colours or give washing instructions. After considerable research and development, we have successfully made waterproof labels that will withstand at least 50 washes in washing machines, set at 50°C. Now, blind people can identify colours, materials, washing instructions, etc on the clothes they wear. 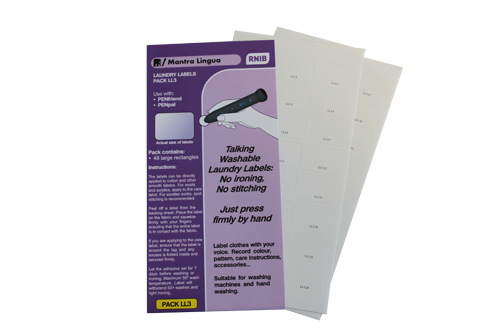 The labels don’t have to be stitched or ironed - they are attached with finger pressure. This has never been done before, and this product is the world’s first. Each label can hold up to 1 hour of audio content and can be written on as well. A tremendous breakthrough! Schools may wish to consider these for the labelling clothes, instruments that need to be washed, or toys in water play. Any other suggestions would be most welcome. Each pack contains 48 labels.